A public disagreement between a Labour councillor in Hackney and the secretary of her constituency party has illuminated and underlined tensions over Labour’s Brexit strategy that have festered in the capital and nationally ever since long time eurosceptic Jeremy Corbyn became the party’s leader. On Saturday, Heather Mendick, a dedicated Corbynite who was elected to her post in Hackney South & Shoreditch in 2017, wrote on Twitter that she had seen photos of “nearly 20” Hackney councillors and one Hackney MP on Saturday’s People’s Vote march through Central London, but “just four grassroots members”. She observed that this was quite different from the balance at most demonstrations where, “we normally get 20-30 from the grassroots and just a few councillors”. 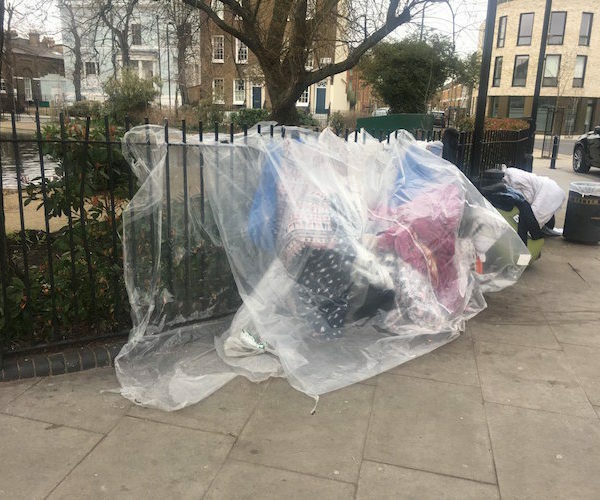 This drew a Twitter response from Sem Moema, who is a Labour councillor for Hackney Downs ward (in the Hackney North & Stoke Newington constituency) and an adviser to Hackney Mayor Philip Glanville. 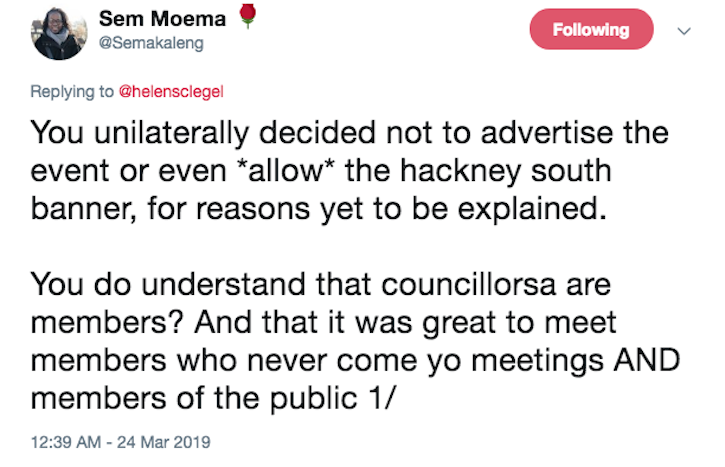 Addressing Mendick, Moema wrote: “You unilaterally decided not to advertise the event or even *allow* the Hackney South [& Shoreditch CLP] banner, for reasons yet to be explained”. She added that it was “great to meet members who never come to meetings AND members of the public”. Replying, Mendick denied making any “unilateral decision”. What isn’t in doubt, however, is what that decision was. 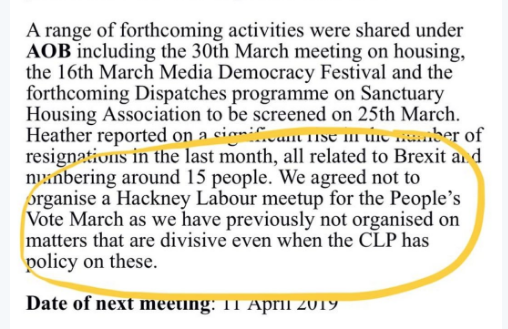 Minutes of the meeting at which the CLP settled on its attitude to Saturday’s event say: “We agreed not to organise a Hackney Labour meetup for the People’s Vote March as we have previously not organised on matters that are divisive even when the CLP has policy on these”. 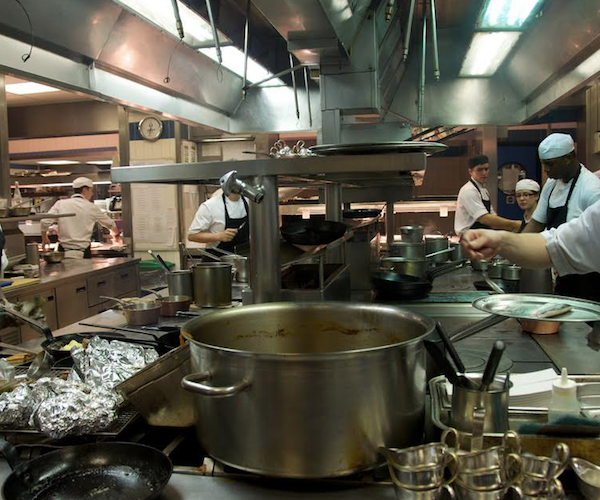 Sources say that the policy referred was decided very recently, when members voted to support a second referendum against the wishes of Mendick among others. Mendick later tweeted that she had meant no criticism of local Labour members who went on the march (“I’m glad people did,” she wrote, though it seems self-evident that she was not among them). 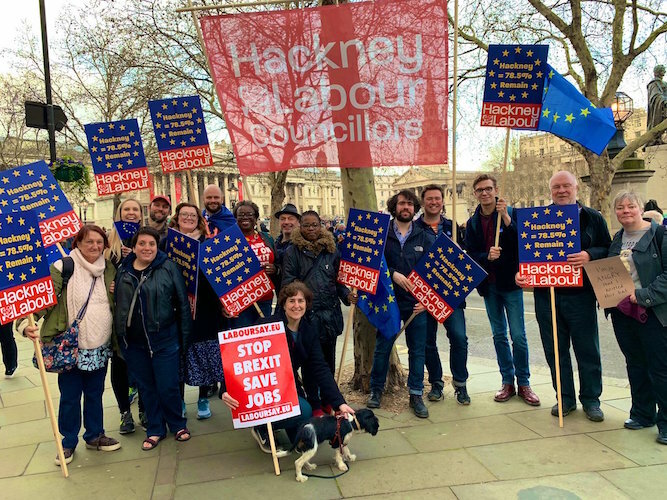 However, the extract from the minutes plainly state that Brexit is a “divisive” matter in Hackney South CLP circles and that it was decided not to organise CLP representation on the march – hence the absence of the banner. And does a sense of some broader fracture in the ranks emerge from Moema’s Twitter intervention? Of course, internal disagreement is part and parcel of every political party, at whatever level of organisation. But Brexit is no minor issue and it clearly excites strong and conflicting views in Hackney Labour circles. The Hackney MP Mendick mentioned, though not by name, who went on the march was her very own Meg Hillier, who has voted against Brexit repeatedly, including not to trigger Article 50 in the first place. However, Hackney North’s Diane Abbott, a loyal member of Jeremy Corbyn’s shadow cabinet, was not there. 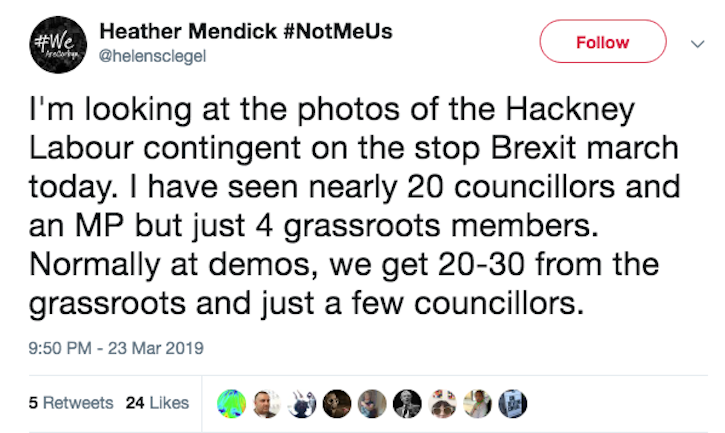 One local Labour member who went claims, seemingly contrary to Mendick, that there were actually “hundreds” of Hackney Labour members present on Saturday. There are also interesting questions raised by the fact that Hackney as a borough voted 78.5 per cent to Remain in 2016, one of the biggest Remain margins in the capital and in the country. 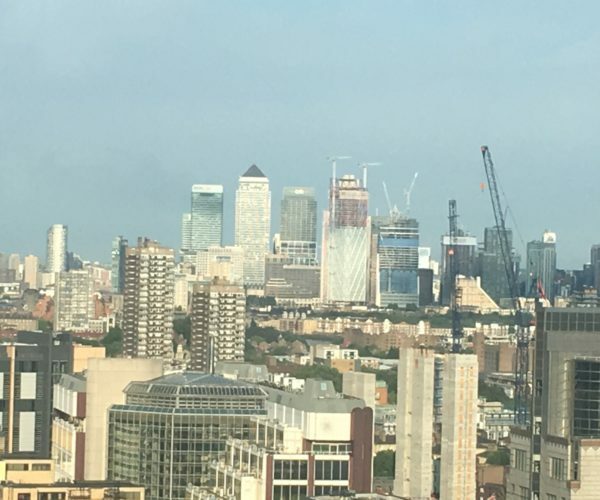 Does a CLP in such a borough have a responsibility to give campaigning expression the views of a huge majority of local voters, especially as it is Labour policy to back a second referendum if it enables a “damaging Tory Brexit” to be stopped? Jeremy Corbyn himself, the MP for Islington North, mentioned the People’s Vote march in the House of Commons yesterday when criticising Theresa May. Yet he himself was in Morecambe, Lancashire, on Saturday. If there is a second referendum, would he campaign enthusiastically for Remain? After all, he didn’t last time.